I've probably said this many times, but I love dance. I don't know what it is with dance, but it just makes me so happy. I could be having the worst day and go to dance class, and all of a sudden I feel great. Guess it's the all those crazy wacky chemicals in our body that reacts to exercise and music, but mine is on high wire. Yesterday after work, typical day, finish work, go to dance practice for 4-5 hours or so. Then one of my dance friends mentioned there was a club event going on at night. So I said sure. Why not. It's been a while since I went clubbing and I really do enjoy dancing all night long. 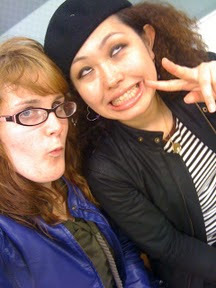 After a brutal, but fun class we got a shower and went of to shibuya's Harem club. Basically the reason my friend likes to go to this club is because our dance teachers like to go there at night, and it's so fun to watch them breaking out there moves on the dance floor. Watching from the circle of dancers and looking around at all the amazing dancers, a few some of the best hiphop dancers in japan, it makes me want to get even better. I can't lose to myself.